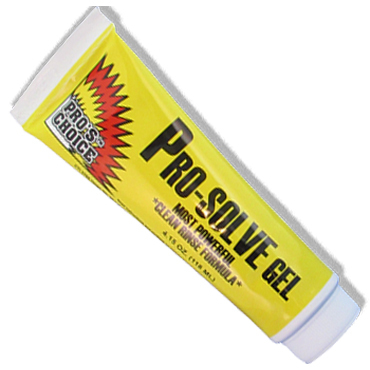 Pro-Solve Liquid will dissolve foam blocks! Be sure to rinse thoroughly after use! Meets VOC standards in all 50 states! Pro’s Choice Pro-Solve liquid is an aggressive, heavy-duty, extremely powerful solvent-based spotter for the professional carpet cleaning technician that completely dissolves troublesome oil based stains like adhesive, gum, tar, paint, ink, cosmetics, wax and polish from carpets, rugs and upholstery and leaves no residue. Restrictions on Use: Professional Use Only. Keep out of reach of children. Flammable liquid. Dissolves foam blocks. Storage: Avoid excessive heat. Store the product in a cool dry area away from ignition sources. Loosen closures cautiously. Avoid excessive heat. Keep container closed when not in use. Container Size: 7 oz. tin with applicator. VOC content: Meets VOC standards in all 50 states. Flammability: Flash point: 68 °F. 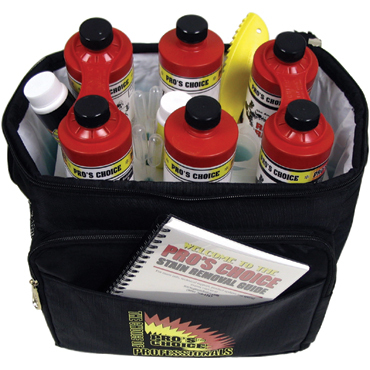 NOTE: Pro’s Choice Pro-Solve Liquid is included in the Pro’s Choice Professional Spotting Kit. 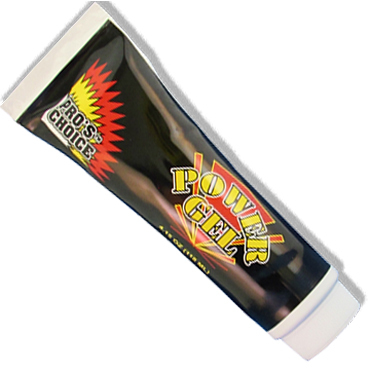 Always test on an inconspicuous area before using because this product can damage some surfaces and materials. 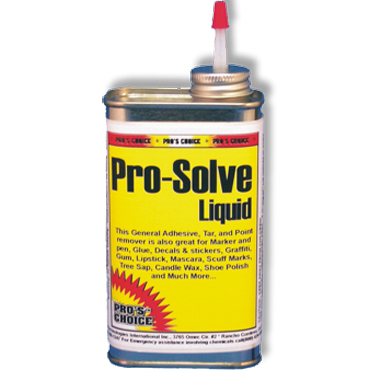 WARNING: Pro-Solve Liquid will dissolve foam blocks! Be sure to rinse thoroughly after use! General Spot and Stain Removal Usage: Apply to contamination. 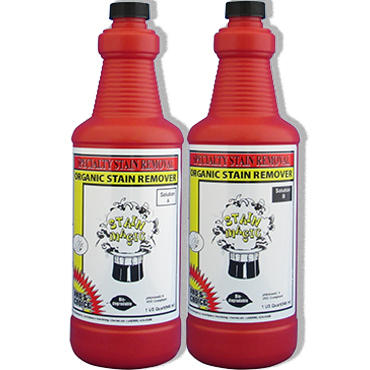 Agitate gently to dissolve contamination and blot up with a dry, absorbent cloth. LIBERALLY wet the ink deposit and the area extending one inch around the deposit with Stain Magic<. 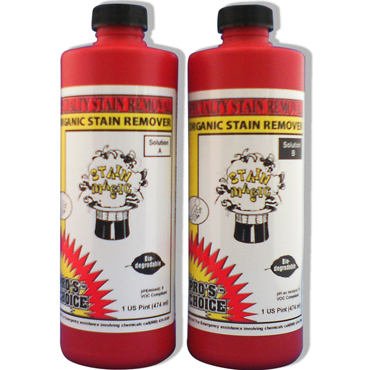 Stain Magic is an oxidizer and will oxidize the color from the ink as the solvents break it down. 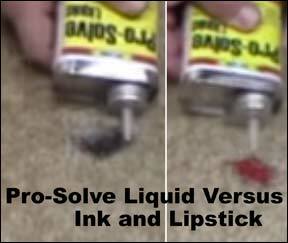 Apply Pro-Solve Liquid to the ink and gently, but thoroughly, agitate the deposit with a Carpet Shark or a bone scraper. As deposit dissolves, the Stain magic will remove its color. 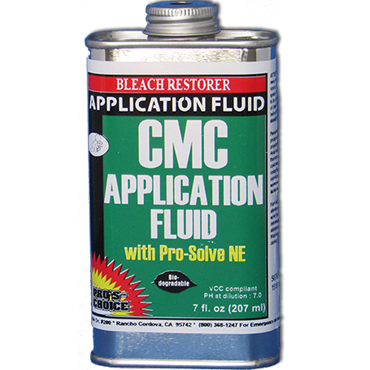 Alternate applications of Stain Magic and Pro-Solve Liquid as needed. Once the ink stain has been emulsified, extraction rinse and blot dry to finish. Apply Stain Blotter to prevent wick back of any ink that got into the backing or carpet pad. Hot water extract and blot dry. The Bane-Clene® chemist demonstrates at a spotting class for carpet cleaning companies how to remove cosmetics from carpet. Presentation at a Bane-Clene training class by Bane-Clene's chemist on how to remove ball point pen, permanent ink, theft deterrent ink and Hi-Liter from carpet. 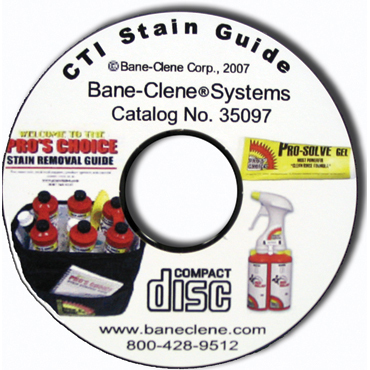 Video from a Bane-Clene carpet spot and stain removal class for carpet cleaners on how to Remove Oily Soils from carpet such as petroleum oil, grease, paint, glue, etc. 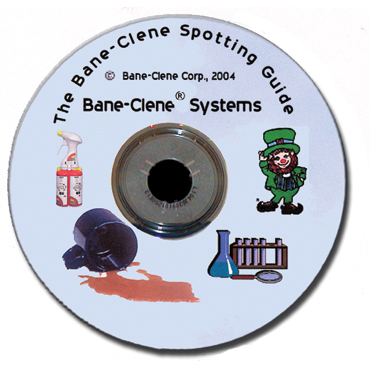 Video from a Bane-Clene carpet cleaning training class for professional carpet cleaners by Bane-Clene's chemist, Don Terry, on how to remove paint from carpet.